I like it. At least two SAS services will be needed to provide comparable service to lower 2nd Ave versus upper. We don’t have to split the back into separate and services. Houston St-2nd Ave will get significantly more service by having the and stopping there, plus a transfer to the and ( V ). I’m not sure how that is. The and combined would certainly have higher frequency than the alone (I think they already do now). Remember, the runs as frequently as it does now is to accommodate the heavy ridership in Queens. Replacing the in Brooklyn with the and would be significantly more service on the two-track section of the line north of Bergen St (as well as a handy reroute via the at Jay St). And it becomes much easier to provide a Culver express service without the local stations between Jay and Church taking a huge hit in service frequency. The biggest expenses would be reconfiguring Chrystie, so the and can continue into Houston-2nd Ave on the express tracks, then continue past 2nd towards the Rutgers St Tunnel. Of course, there’s also the matter of reconfiguring Grand, so the and ( V ) can go straight into the existing station (no “Deep Chrystie” needed!). The dead-ending at Hanover Square waiting for a new East River tunnel that may never come definitely won’t provide any relief to the to/from Brooklyn. And the via Montague and the would probably provide just a little relief, given that’s an all-local route with a lot of stops along the way. It certainly wouldn’t be much faster to Midtown Manhattan than the . As for turning the at 2nd, reconfigure the local tracks there to continue straight down Houston to a point (perhaps Pitt St/Avenue C) where they can be close enough for trains to relay. Maybe even put a new station at Avenue C.
I see your point but I was not saying it is a problem just making note of that. This is the only point of confusion for me with @bobtehpanda's plan. Why are we sending 6th local to the WillyB when doing so with 6th express would be (from a construction perspective) much simpler? We need to adopt an "organization before electronics before concrete" approach to running the subway system. More service begets more ridership and fewer budget deficits, which increases the likelihood of funding for future expansion. There's a lot of unused capacity in the existing infrastructure today, namely Broadway, 8 Ave, and Broadway. Deinterlining + fixing terminals to increase capacity is an order of magnitude cheaper than new tunnels + East River tubes. 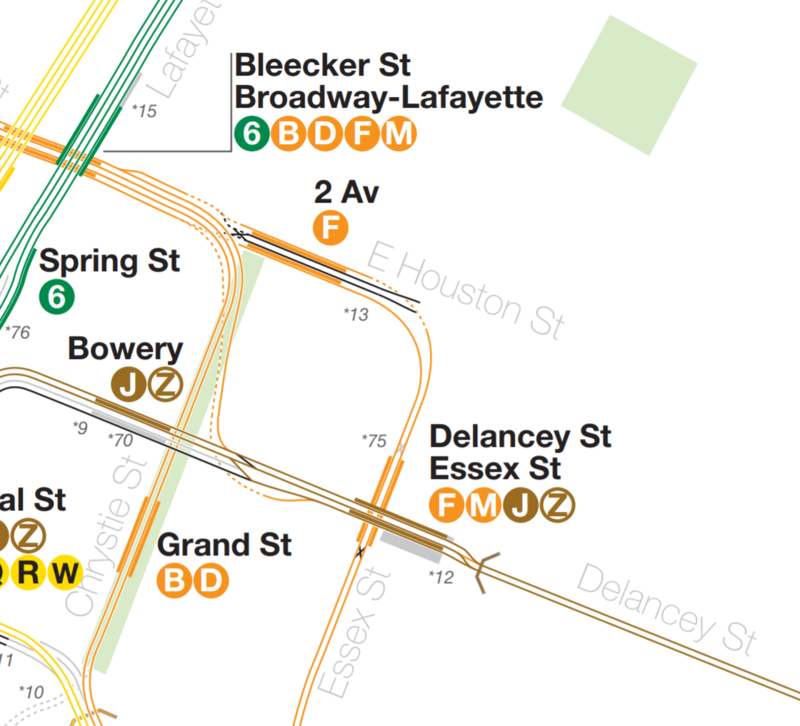 The problem with completely severing the 6 Ave express tracks from the Chrystie St connection is that one of the 6 Ave track pairs will dead end in the LES, which really doesn't have to be the case. The IND Second System planned for an extension of the express tracks into Williamsburg via a new East River tunnel, but clearly that's not on the table. Connecting the express tracks with the Williamsburg Bridge effectively achieves this at considerably less cost by utilizing existing, underused infrastructure. Then in a future phase, build the Whitehall - Court St tunnel to send the to Fulton St. The independent Bay Ridge - Nassau St line can become the basis for the SAS express tracks, with the Nassau St stations rehabilitated with extended platforms as appropriate. You can already turn trains at 2nd Av today, the same way the did. All you have to do is connect the to what are the "local" tracks at 2nd Av. The express tracks are not currently connected, so you'd have to do some level of work anyways. And even in the most optimistic world, a Houston St - Williamsburg tunnel would be another phase, and until that happens 24-30 TPH to dead-end at Second Avenue is a bit much. Plus I'd like to keep the Ridgewood-6th Avenue connection; IIRC Delancey-Essex has severe congestion issues in the transfer complex itself. We need to adopt an "organization before electronics before concrete" approach to running the subway system. More service begets more ridership and fewer budget deficits, which increases the likelihood of funding for future expansion. There's a lot of unused capacity in the existing infrastructure today, namely Broadway, 8 Ave, and Broadway. Also, fixing terminals to increase is an order of magnitude cheaper than new tunnels + East River tubes. Yes. The and currently fly over the switches between the middle tracks at 2nd Avenue; I highly doubt there'd be enough space to do a full flip without rebuilding 6th local to dip downwards. Connecting 6th express to the northbound Chrystie track is really simple (they run parallel at about the same level entering Bway Laffayette) and while the southbound one would be a bit more complex, it certainly would not entail the same degree of work as a full rebuild of 2nd avenue itself. The Second System meant to provide additional capacity to North Brooklyn as well; this is just rearranging the deck chairs on the Titanic. At the end of the day you still have four pairs of track across from Manhattan to Williamsburg. I believe the and Broadway simply won't suffice in coming years. And the to Jamaica Center is very questionable given that the Jamaica Line is so slow and stops so often. Even a express probably wouldn't save much time over the to WTC. Or the to 2nd Av. I'm confused. How would you link the SAS to West End? You can add 6tph to the with more traction power, 10+ with a good terminal+traction power, 6tph to the with a halfway decent bridge approach, and up to 60 cars per hour to each with platform extensions. If you do all of those (ie everyone's running at 30tph*10cars) you've functionally added 28 8 car trains per hour to the river crossings (+6 WillyB, +10 , +(120/12) platform extensions). And that's before you get into the potential of the as a reliever/redistributor for the area. About the -- the intention of the Jamaica line should never ever ever ever be to serve Jamaica Center. Today with skip stop, is only time-competitive with the to the *eastern half* of Lower Manhattan; hardly an impressive stat for a service pattern that was to somehow magically save the from itself. Where the Jamaica line can make gains against QB is in intercepting core bound trips on buses like the Q52 before they hit Queens Boulevard. Today, the is almost competitive with Bus-QB, but it gets killed by low frequencies, slow movement, and the need to xfer for anywhere that's not Lower Manhattan. To fix this, you need halfway decent frequency (so no more skip stop) but also halfway decent runtimes (so half of trains express from Crescent to Marcy). ...but also halfway decent runtimes (so half of trains express from Crescent to Marcy). In that case, forget it. There's a reason why the stretch between Crescent Street and Broadway Junction is stuck with two tracks. Sure, until you build a third one... Just because it didn't work 70 years ago doesn't mean it can't be done today -- new track, roadbed and structural technologies exist. There's also an argument to be made that that whole section of line should be rebuilt in the fashion of the Market Frankford line in Philly. Tear it down, build it back up as a concrete el with 3 tracks, side platforms and ADA, and just be done with it. I'd like to see them abandon skip stop, make the full time local (which also eases overcrowding on the ) and make the express from Broadway Junction to Manhattan. Solution # 2: use the multitude of empty lots along the line + eminent domain to create space for stations on a single level. Wow I’m dumb. This should be +6 WillyB, +10 and +([30*2*2]/8) = 31 ‘new’ 8 car trains. 1. Great, a waste of funds just to have that express track. 2. Sure, because eminent domain will totally fly in a community where the median income is only somewhat better than that of Brownsville (and, given the area, would likely not have suitable replacements). You would be better off having any potential express track follow Jamaica Avenue, anyway, as the curves by Alabama Avenue and between Crescent Street and Cypress Hills are extremely sharp. Of course, doing this means that you'd run into virtually the same issue as the previous proposal, where the only express station between Jamaica and Broadway Junction would be at Woodhaven Boulevard (the only difference is where the station in Jamaica is located). 1. "Just to have that express track"? Cutting 4-5 minutes off of commutes from southern/eastern Queens and alleviating some of the pressure on QB not good enough for you? 2. Yeah, eminent domain is fraught. 3 tracks would be able to fit over the street, but in station areas there'd need to be some condemnation. That said, if you can demonstrate the need for it and the benefits that'd come from it, I imagine this would be at least more than a non-starter. Certainly something to think about. The Jamaica Ave proposal is everything wrong with the way people think about the Jamaica line in general in a nutshell. No one works on Jamaica, and half the catchement there is a park. Fulton St -- where it currently runs -- is a bustling commercial corridor. Why penalize the very real folks who want to travel to/from intermediate folks on the line to help those further out? Sure, the curves are slow, but is geometric perfection really more important than making a given transit service relevant to the area it serves? That way, you get a psuedo-Williamsburg express to relieve the . You can get the express by still building the third track. Is there a level change to the Sixth Av express? Yes, but that doesn't really stop anybody, look at how crazy Jackson Heights-Roosevelt is. If you feel some type of way about 30 TPH hurtling down Utica, you can either terminate half of Sixth Avenue at Utica or in a later phase substitute the somehow and give the extra capacity to the . And it's about the same size as Queens Plaza - Jackson Heights. Expresses don't save that much time for local or intermediate travel, so I don't think it would really help a commercial corridor or hurt it. Having express service run via a structure over Jamaica Avenue would be more palatable because half the catchment area consists of cemeteries and could serve as a demonstration that modern el structures reduce noise and don't block out the sun. I like your proposal of having locals end at Woodhaven and expresses make all stops past there. I don't think a stop at Crescent makes sense, and retrofitting the structure by rebuilding stations with side platforms and taking some property would really escalate the cost. Having an el structure over Jamaica Avenue would speed up service with one fewer stop, and more importantly because it would avoid the sharp curves, allowing for an actually fast express service. I personally think that the express track would be better on Jamaica given the sharp curve. As for the lack of an express stop, you could maybe make Cypress Hills an express stop with the design of the old Manhattan els (express track in center above). The track would then stay elevated until Woodhaven (locals would terminate on a center track below the El; the express track would then slope down and reconnect to the locals just east of 104th. The express track would however continue until the end of El in case it is needed for storage purposes. Under both of your proposals (especially the second one), this entire bit is moot, as none of the stations along Fulton Street will have express service, anyway. If this had been about local service, that would be a different story, but literally no one called for rerouting that. I’m just interested to know how you’d get the and from the express tracks at Broadway-Lafayette to the “local” tracks at 2nd Avenue? It doesn’t look like there’s enough space upon leaving Broadway-Lafayette for the and to get under the tracks without running into the existing ramps that the and currently take to get to Grand St and the Manhattan Bridge. I somehow missed that this proposal was only for the express track. My bad. Now that said, I don't think having the express track begin at Woodhaven and run clear through is all that good of an idea. I realize I've proposed it before, but it was under the assumption that we'd also have a stop at Crescent, and even then I dunno. The issue isn't so much the length of the interstation, but the number of people beyond it. Express service would end up benefitting really only those at Woodhaven, 104, 111, 121, Supthin and Parsons. If this proposal is primarily meant to serve Jamaica/Richmond Hill, that's fine, but if we want to induce development in Woodhaven and Cypress Hills, I'd consider starting the express track further in -- which is where the Crescent proposal came from. Yes, this keeps the curves in the mix and yes, that's a big runtime impact, but part of me does wonder whether its not more cost effective to widen those to be good for 20 or 25 and build from Crescent than build from Woodhaven along Jamaica. On the North end, the lots abutting the curve are pretty empty; south end is more complicated (you'd probably have to condemn the buildings who literally touch the curve) but again, I wonder. The obvious objection here is of course property impact, but if we assume that we're building the express track either way, I can't help but feel that comparison isn't so clear cut. We could accomplish this by connecting the 2 Av line to the LES-2Av express tracks on the south end and then running the result as a four-track trunk under the East River according to something similar to the Second System plan/ You'd basically run four tracks under the East River, and you'd need to drop the down enough to stay underground and curve north under Houston before diving under the river. I'm not sure whether to suggest four or six tracks for the trunk (four is easier to build, but also limits branching and total flow down to 60tph peak. The trunk would basically replace the existing Jamaica El, with express stops at Marcy Av and Union Av, then a local stop at Flushing Ave before an express stop at Myrtle Av. From Myrtle Av the could branch off and serve the existing line to Metropolitan Av, while one of the 2 Av lines could run under Malcolm X Blvd/Utica Av down to Kings Plaza, while the main trunk continued along Broadway/Fulton St/Jamaica Av with express stops at Broadway Junction, Cypress Hills, Woodhaven Blvd, and Sutphin/Archer and an option to extend the line out into southeast Queens? Under this setup the would run basically its current routing at all times, the could operate as the Jamaica local, while the and operate down the corridor as expresses. The would turn off at Myrtle Av to serve Utica, while the would run from Jamaica Center through Manhattan as a 2 Av local service. That would give you room for four services on 2 Av; the running as 2 Av local trains above 63 St, the and running as 2 Av expresses from 125 St to Houston and Jamaica/Bushwick expresses from Houston to Myrtle Av (for the ) or Jamaica Center (for the ). The would be rerouted to serve Astoria-Ditmars under this plan, which would completely deinterline the Broadway express and local service. In the Bronx/northern Queens we could split the trunk into two additional trunks carrying 30tph each; one trunk would split off at 86 St before heading under the water to Astoria Blvd, running to LaGuardia Airport with express stops at 31 St, 82 St, and LGA main terminal, and local stops at 21 St, Steinway St, and Hazen St. The other trunk would run up 3 Av to Fordham Plaza, with the making express stops at 125 St, 149 St/3Av, Tremont Av, Fordham Plaza, and Norwood-205 St; the Q would make all local stops between 86 St and Norwood-205 St. From there, the would terminate and the and would continue under Gun Hill Rd to Bay Plaza.